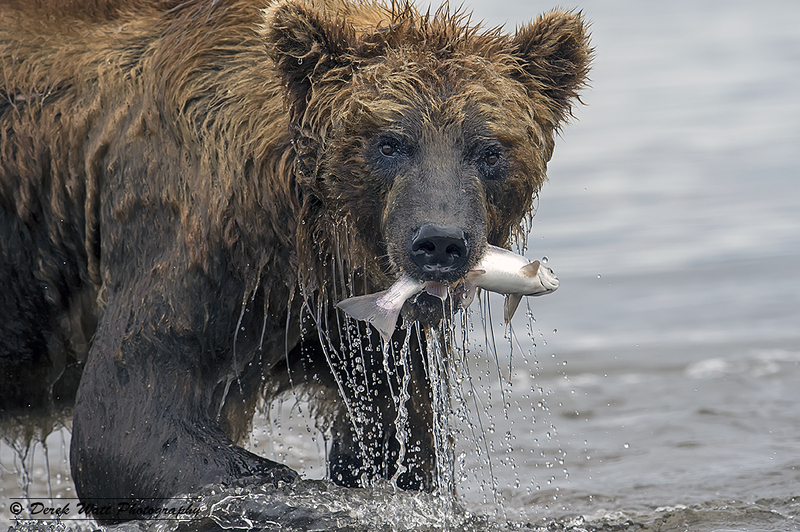 A brown bear catches a salmon. Kuril Lake, Kamchatka 2013. 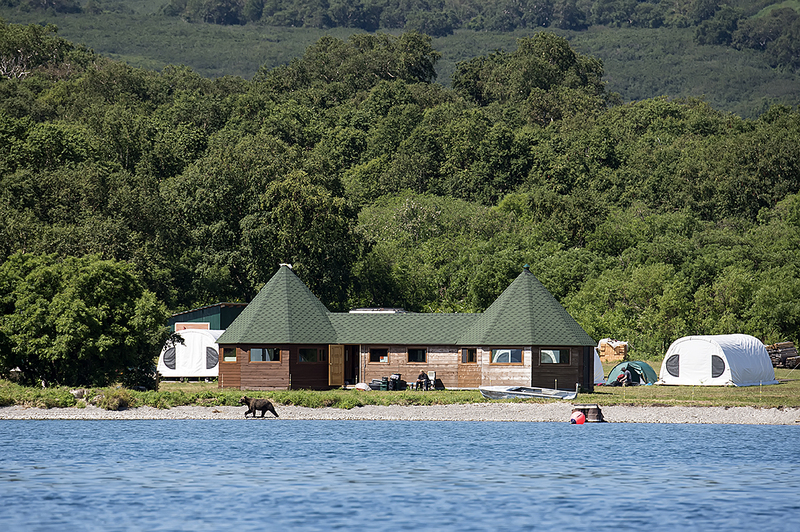 Kuril Lake Campsite & Ozyornyi Ranger Station. The ranger station and the campsite are located at the point where the Ozyornaya river flows west from the Kurilskoye Lake. 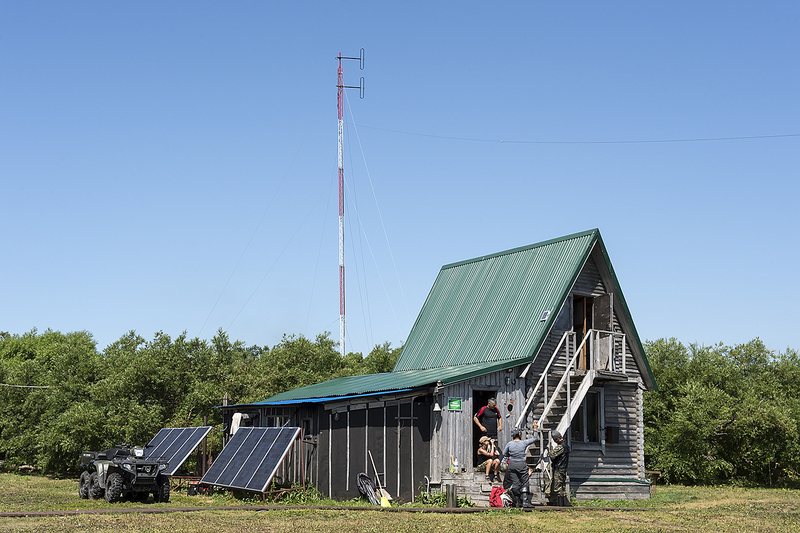 Also located here is the scientific station where the salmon are monitored as they travel up river from the Okhotsk Sea into the lake and surrounding rivers upstream where they will spawn. 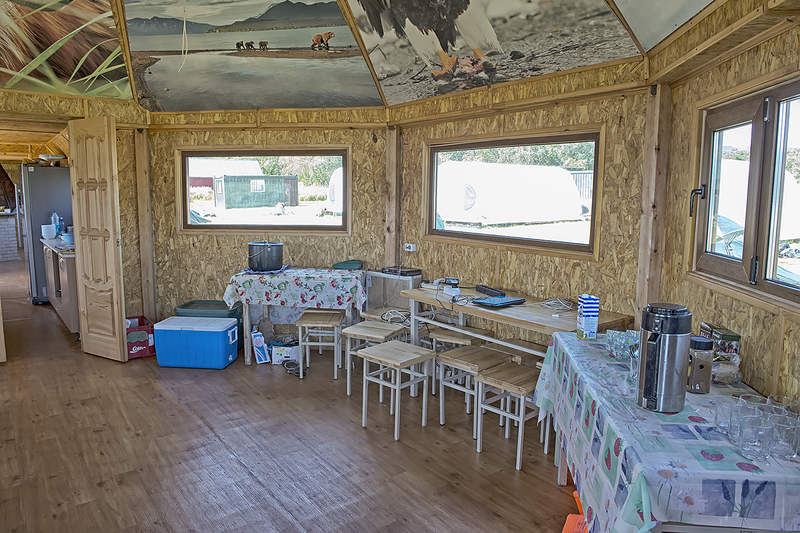 The campground consists of a number of permanent rigid tents with fold out cot style beds, these tents can accommodate five people per tent. There is also the option to pitch your own tent, which is what I and several others chose to do. I later found out from Marco that these permanent tents were freezing cold inside during the night so I think I made the correct choice. 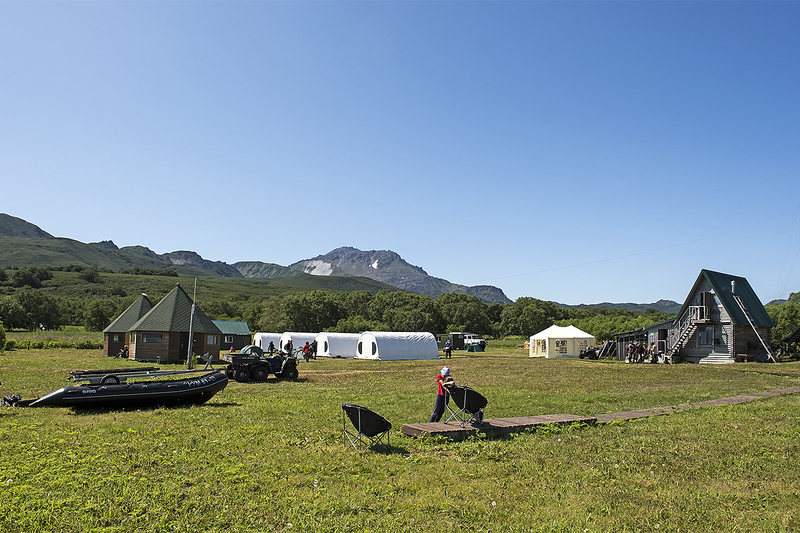 The campsite at Kuril lake. The kitchen/Dining building on the left. The rigid tents in the centre and the ranger building to the right. A bear walks past the camp. Image taken while returning from one of our trips. The ranger/inspectors station situated on the edge of Kuril lake. 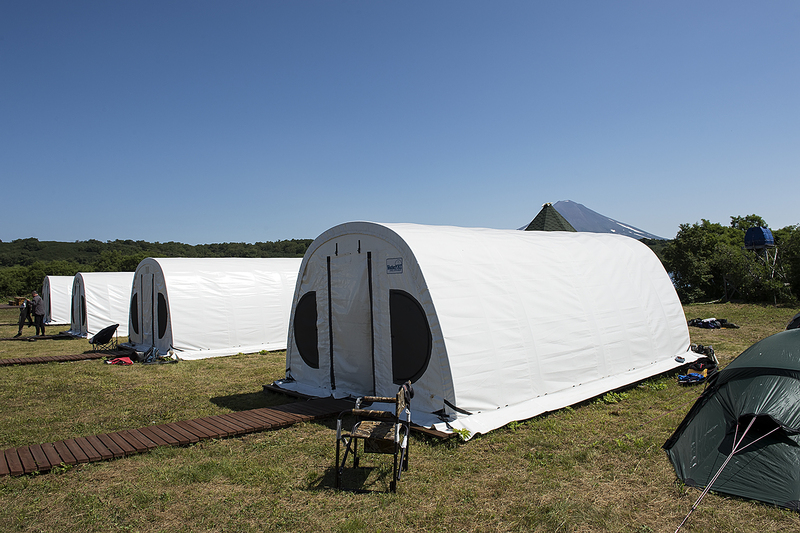 The rigid tents which can sleep five people. The toilets. One for the men and one for the ladies. Inside looking towards the kitchen with the dining area to the left. The area where all the batteries were charged after a day out. This image was taken on the last day as we were packing to leave. It was normally buried under cables, chargers and laptops! 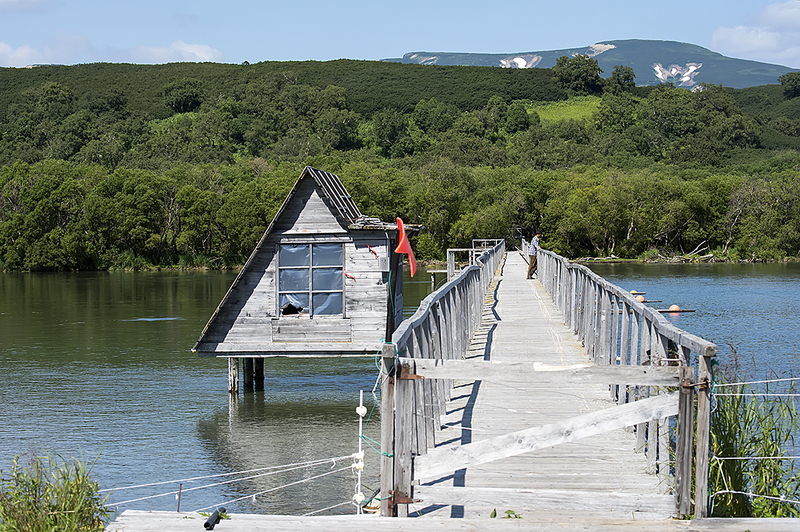 The scientific station where the salmon are monitored as they travel up the Ozyornaya river from the Okhotsk sea into Kuril lake. 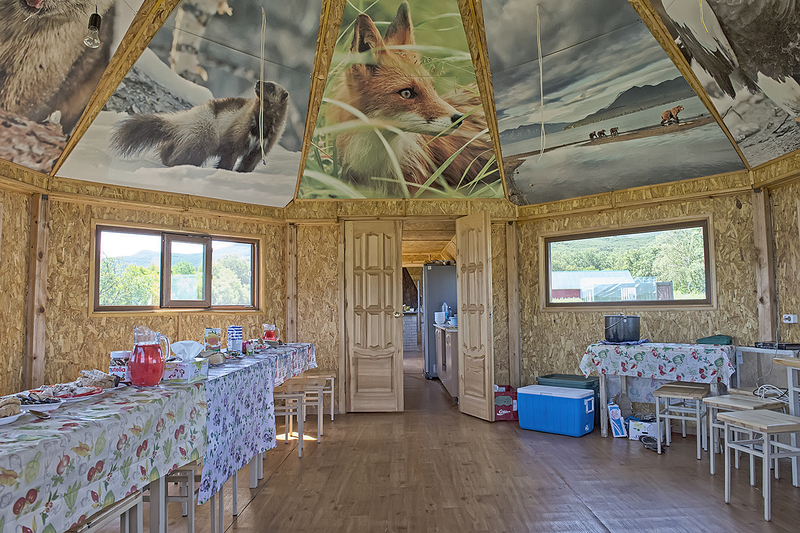 There is a permanent wooden cabin style building which is the ranger/inspectors station and another modern wooden cabin which consists of the kitchen/eating area. 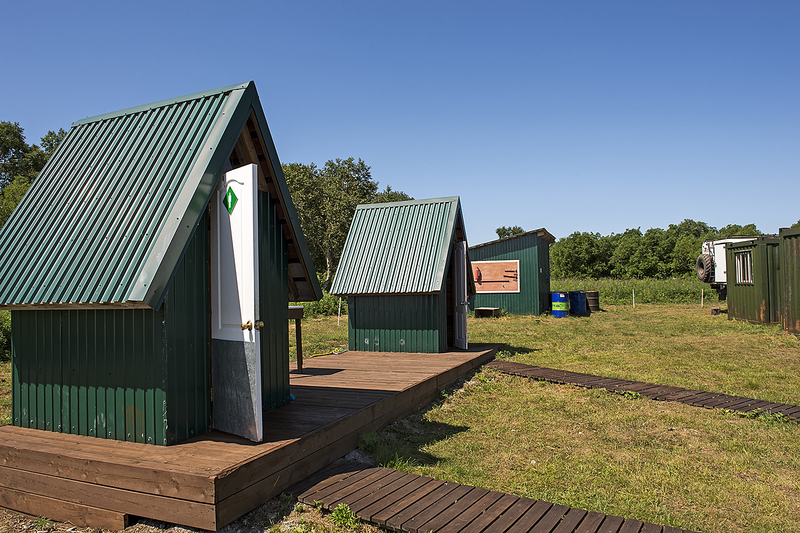 The toilets consist of two outdoor wooden hut buildings one for the ladies and the other for the men. All the water for the camp comes from the lake and is pumped by generator into a large storage tank. There is no mains electric all power comes from a petrol generator which is run as required. Some people who like the comfort of hotels may not like this style of living, I thoroughly love it, the toilets were clean as was the rest of the camp and the water was fresh – I had no problems with drinking it. The camp is ringed by an electric fence similar to those for controlling cattle and horses. In reality a bear would break right through should it try, the bears can detect the electric current and that is enough to deter them. This is complete role reversal from being at a zoo, it is the humans here who are contained behind the fence in the bears world. Bears wander past the fence many times a day, on the the first day shortly after arriving a huge male ambled along the grass between the camp and the lake. A rush of tourists with cameras down to the fence for a closer look was met by an urgent shout of nyet! nyet! nyet! and motions to get back, as one of the rangers armed with a shotgun ran down and ushered people back from the fence to a safer distance. Another ranger station (Travyanoy/grassy point) is located a few miles round the lake, a short distance from this is a memorial for a japanese wildlife photographer who was killed by a bear a few years ago. You’re in the bears world, there are no ambulances or hospitals nearby and it’s over an hours flight back by helicopter! An image of Marco, Elena our translator and Nikolai our inspector. Image taken as we return from one of our trips. Myself and Marco would be out together, along with Nikolai our designated inspector/guide and Elena who was our translator for the duration of the trip. We decided in order to maximise our photography time we would leave early in the morning to get the best light, then return to camp early afternoon when the light was harsh in order to download memory cards and charge batteries. We would then go back out in the afternoon, around three o’clock and stay until the light became insufficient. Operating this way allowed us to download our mornings images which meant we only had half the days shooting to download in the evening when we returned, as by the time we returned the other group were already back in camp. Trying to find an available socket to recharge batteries or connect a laptop in a tangle of cables early on was sometimes quite difficult, however more sockets were found to alleviate the problem. 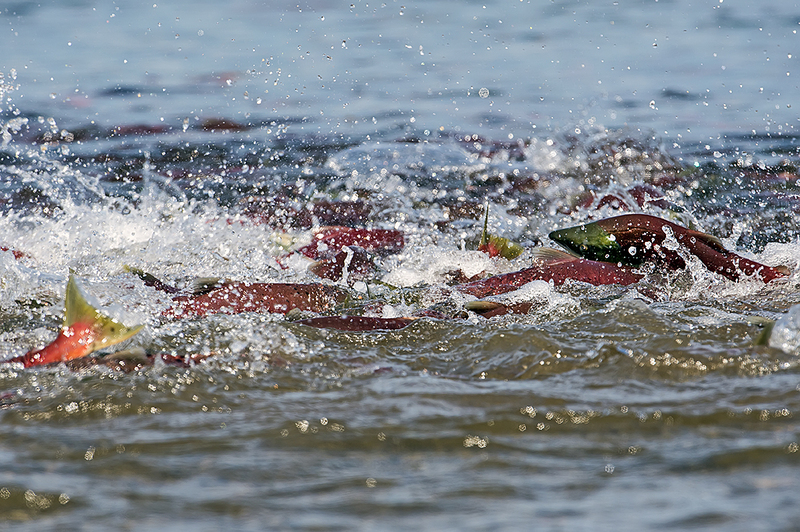 Sockeye salmon spawning in the shallow water of Kuril lake, Kamchatka. 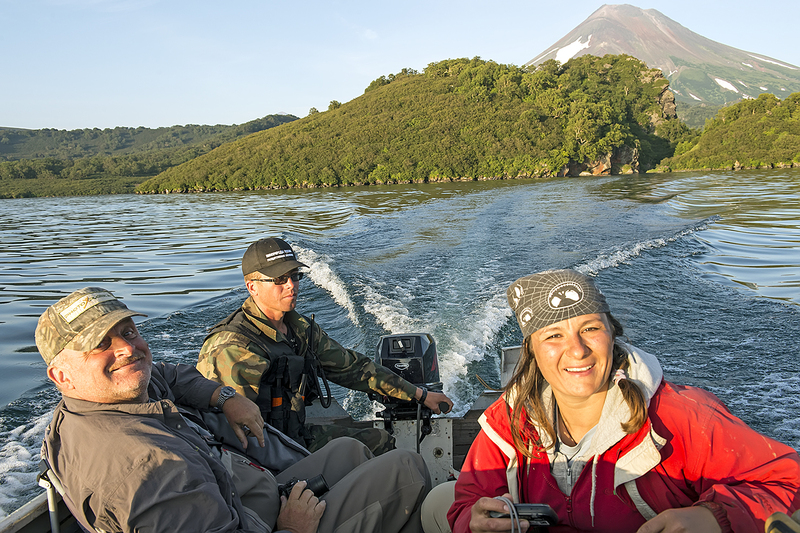 Kuril lake covers an area of 30 square miles and reaches a maximum depth of 1000 feet, the only way to get around the lake is by using a small boat. From the campsite It takes about fifteen minutes by boat to the furthest point away. Looking on a map there are a number of rivers and streams entering the lake from the surrounding hills. These rivers and streams are bolstered by the snow melt from the higher ground. Even in the middle of summer snow was still present in the contours of the hillsides. 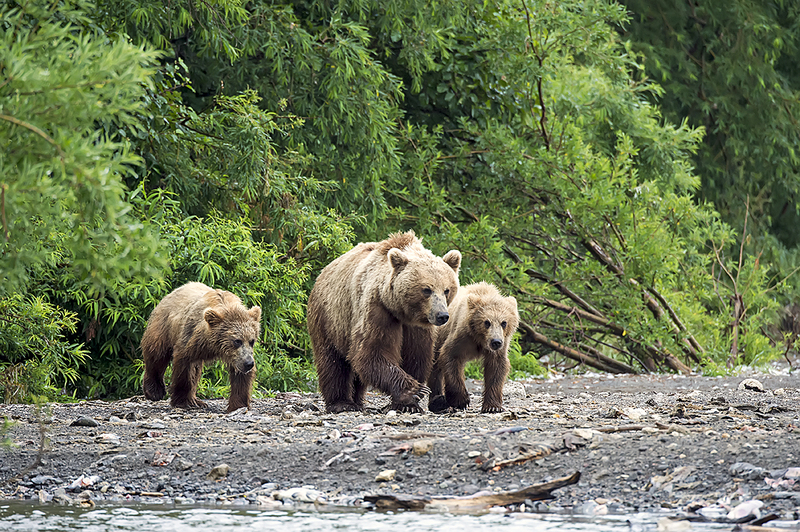 The bears come to the lake at this time of year to gorge on the vast number of salmon making the journey back to spawn in the very rivers they themselves were spawned. Unfortunately as we were informed there was a lot of snow last winter which resulted in the river levels being quite high this year. The increased water level allows the salmon to swim freely upriver without being constrained at the mouth of these rivers, which usually occurs when the water levels are lower. With the low water levels the salmon are forced into large schoals in the shallows as they prepare for the final push up to their spawning areas. 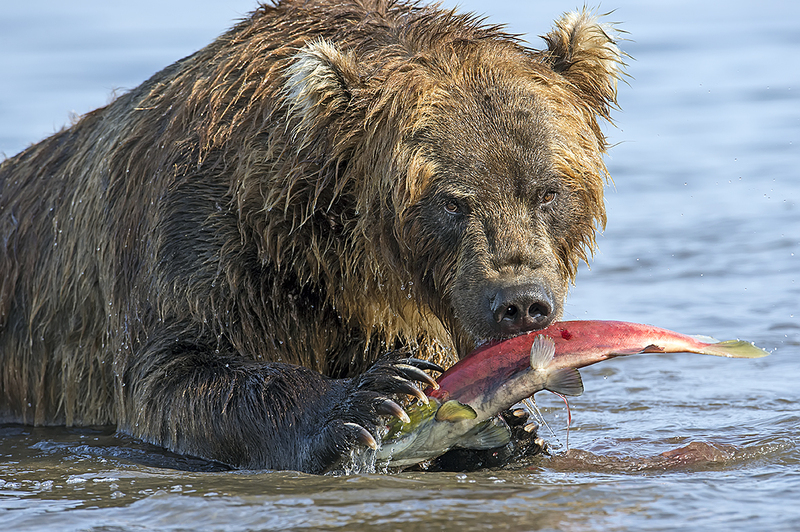 The bears have easy pickings with such a high concentration of salmon in the shallow waters. It is these huge number of salmon that provide the food source which will ensure the bears have enough fat reserves to make it through the next winter. Easy pickings. 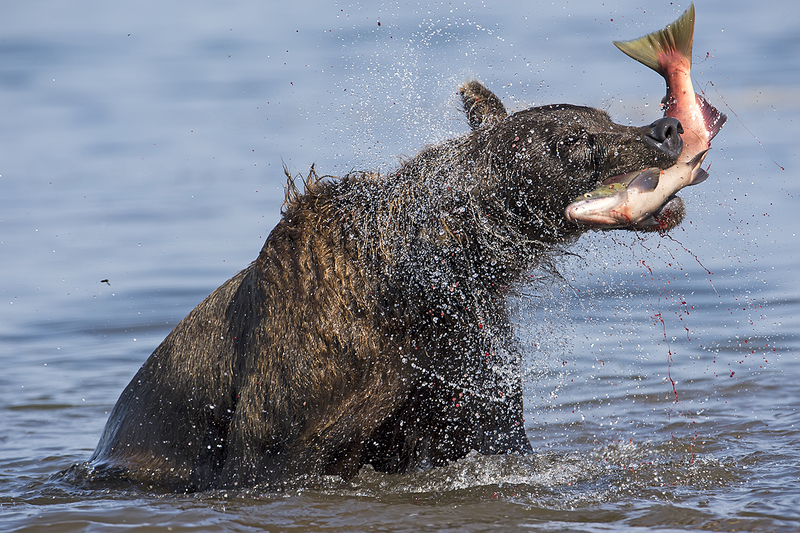 A brown bear catches a salmon with spray and eggs flying in all directions. Another bear another salmon. The bear shakes it’s head in a frenzy sending spray and eggs flying. 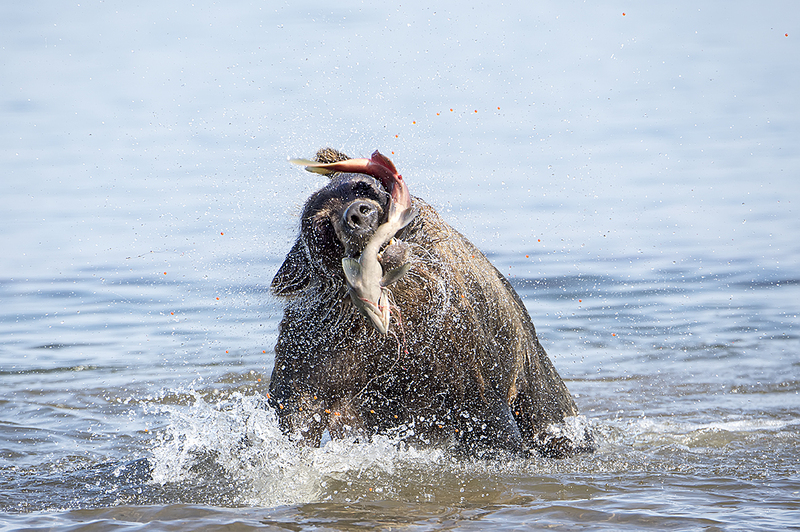 A close up portrait as a bear tears into a sockeye salmon. 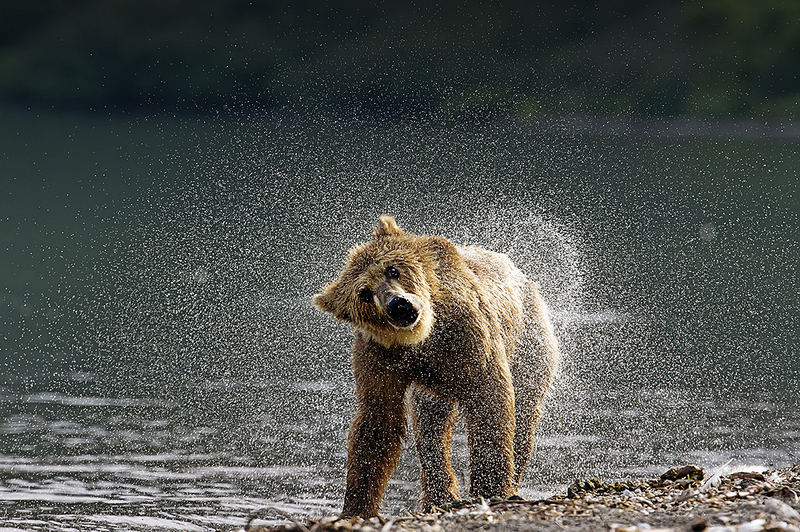 A bear shakes itself dry after leaving the water. There were a few rivers around the lake where photography was not possible due to the higher water level and no space on the shoreline to setup our equipment or position ourselves suitably in order to photograph the bears. The bears also seemed to avoid these areas and move to locations where it was easier to catch the salmon. We concentrated on four rivers entering the lake and the shoreline areas in front of theses rivers. We also chose our location with regard to the position of the sun during the day, choosing one location in the morning and a different location in the afternoon. We never had a drop of rain for the entire time we were up at the lake, however some mornings were gray and overcast for several hours before the sun eventually broke through. The conditions were quite awkward for photography sometimes, especially with the darker coloured bears. As it was easy to lose the details in the darker areas of the face or fur. On the days when it was gray and overcast if exposure compensation was added to try to bring out the details in the face and fur of the bear, it sometimes resulted in blown out highlights in the water. When it was sunny the shadows were quite harsh which made it important to shoot from the best angle available. 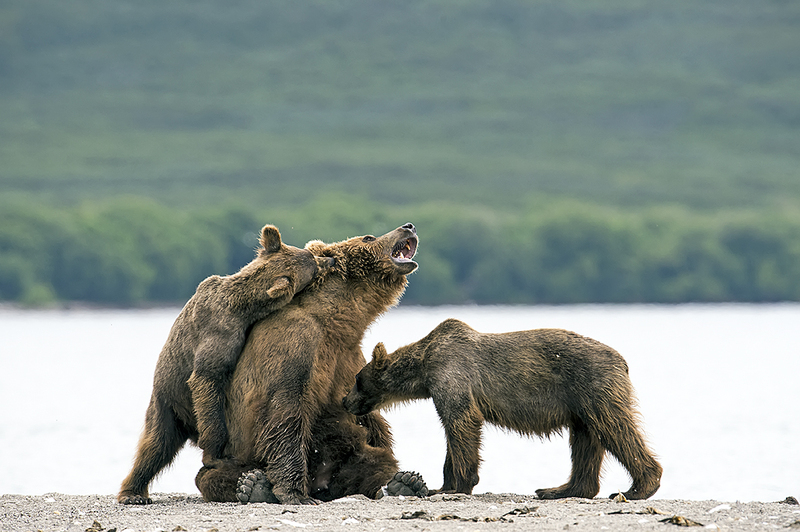 Obviously this is not always possible, especially when photographing wild bears. All of my images were captured using the Nikon D4 together with the 600mm f4 VR lens or the new 80-400mm AFS VR lens. For the landscape and panoramic images I used the 24-70mm AFS lens. On a number of occasions I used a polarising filter to cut down the reflections, especially when trying to photograph the salmon in the water. This did not prove to be as successful as I had hoped. I carried two batteries with me, one in the camera and one as a spare should it be required. At no time during our days out shooting did I need to swap batteries, one benefit of the power of the D4 battery. Every day after returning to the camp the batteries were recharged ready for the next trip. We found ourselves at the same location as the other group on several occasions. This was not desirable for both parties as these situations resulted in too many people trying to photograph the same subject and only ended up with people getting in each others way. My advice to anyone wishing to travel to Kuril Lake – only travel with a small group, from a photography point of view the smaller the better! A mother with young cubs by her side emerges from the trees and leads them down to the lake. The cubs pester the mother for milk. In the late afternoon on day seven the helicopter arrived to pick us up for the return flight to Yelizovo. We now had two days to kill before our flights back home. These two days are used as reserve days incase the weather is so bad the helicopter is unable to land at the lake. On the second day back Marco and myself caught the bus into Petropavlov-Kamchtsky to take a look around. This was the only day it rained during our trip, making the place look even more bleak. The following morning I said goodbye to Marco, as he was the first to leave. I was then driven to the airport in the afternoon for the long flight home. 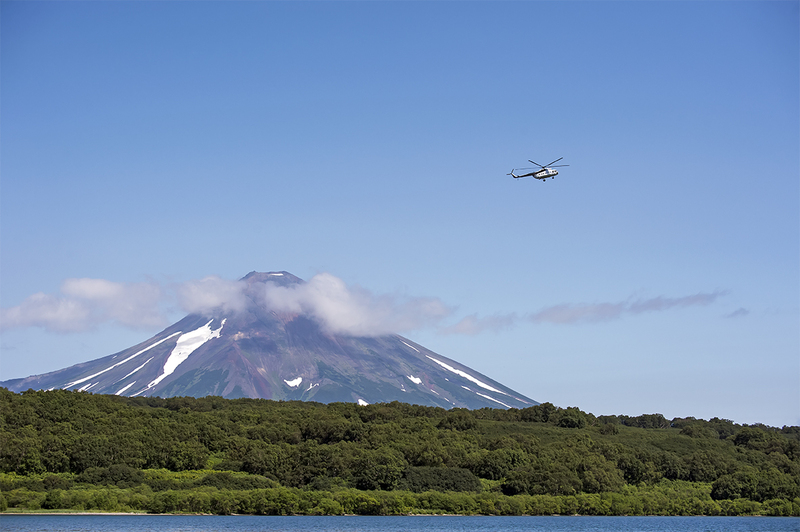 The helicopter seen with the Ilinsky volcano in the background arrives to pick us up from Kuril lake. Before arriving at the lake I had looked at a great number of images from this location and I already had images in my mind which I had hoped would be possible. Sitting here back at home looking through my images I did not manage to capture all the images I had envisaged (maybe I set my sights to high), however I can say I have travelled to a new country and witnessed one of the greatest spectacles in the natural world. Watching a documentary on television cannot prepare you for the buzz that you get from being there, sometimes less than 20′ from the bears. Watching the bears interact with each other, watching mothers suckle cubs, watching a 45min fight between two of the largest males at the lake and the smell of the dead salmon littering the lakeside. All experiences that I would love to go through another time, however time and money may be deciding factors!